India Label Barcode Printer Market shipments reached 29.5 thousand units in CY Q4 2013. EPSON led the market. With the growth of Enterprise and OEMs, the demand for Label Barcode Printers have increased significantly over the past few quarters in the Indian market. Reduction in prices is a major trend observed in the Indian Label Barcode Printer market in order to enhance market share by OEM. According to 6Wresearch, the Indian Label Barcode Printer Market shipments reached 29.5 thousand units in CY Q4 2013. EPSON led the market followed by ZEBRA and TSC.The dominance of EPSON was due the growing demand of 180 and 203 DPI (Dots Per Inch) Label Barcode Printers which captured majority of the market share during CY Q4 2013. 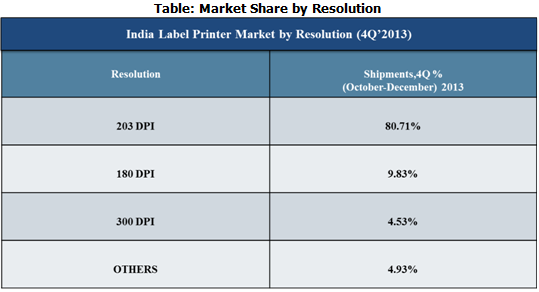 Source: 6Wresearch Quarterly India Label Barcode Printer Market, CY 4Q’ 2013. Note: Others include 200, 305,306, 360, 406, 600, 610, and 4800 DPI Printers. Top 3 players captured around 47% of the total market share. In the Internal Flash Memory segment, 4 MB registered more than 20% share. In the Print Speed segment, 4IPS (Inch Per Second) bagged around 31% share. Label Barcode Printers are available in various printing technologies. However, Direct Thermal and Thermal Transfer Printers captured 94% share of the India Label Barcode Printer market due to its lower printing cost and higher quality. Price degradation as well as enhancement of functionality is a major trend witnessed across the Indian Label Barcode Printer market. Additionally, there has been an increasing need amongst the Indian consumers for enhanced memory, higher processing capacity, smaller form factors, and abilities to handle a wide variety of media.